The hip flexor stretch is one of the essential stretches for lower back pain. In the pervious posts we mostly looked at stretches and back strengthening exercises in particular for the up back, neck and shoulders. Today you will be introduced to the hip flexor stretch an essential in the stretches for lower back pain. Hip flexors are those muscles that flex (= shorten the distance between two body parts) the legs towards the hips, they bend the leg towards the upper body. This movement happens in the hip joints. Hip flexors are very strong muscles because we use them all the time. Strong muscles tend to be short. Problem with the hip flexors can arise when they become too short. Then they can exasperate many back problems because they pull the pelvis forward and arch the lower back. We will examine this in detail in a later post. When you sit in work all day, your hip flexor is kept short. It is a good idea to do a hip flexor stretch at least once a day. Of all the exercises when engaging in back strengthening exercises in particular, this stretch is extremely valuable. It is one of the most valuable stretches for lower back pain. It makes any back strengthening exercises much more effective. It can greatly help to alleviate lower back pain. 1. Stand up and hold on to the table top. 2. Clench your gluteus muscles and pull you stomach in while maintaining your breathing. 2. Bend both knees slightly. 3. 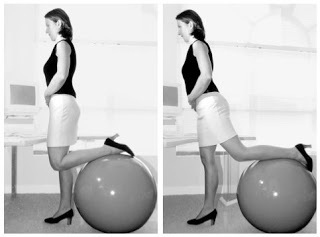 Standing on one leg lift the other ankle onto the ball, keeping the knees together. 4. Keeping the standing leg slightly bent, straighten out the other leg over the ball and backwards. You should feel a stretch in the groin and thigh. Hold this position for 20-30 seconds. 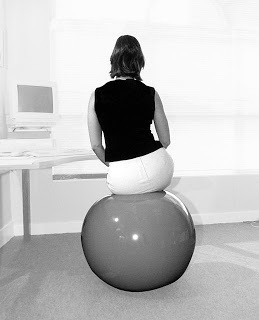 This entry was posted in back strengthening exercises, ball exercises in work, hip flexor stretch, stretches, stretches for lower back pain on November 22, 2013 by flying form. In the previous posts you learned about simple stretching, mobility and back strengthening exercises. You were introduced to an important concept when engaging in back strengthening exercises. It is important to include stomach exercises into your workout to help regain a good muscle balance. Please be sure to review the general guidelines about spinal movement before continuing with the next set of exercises. 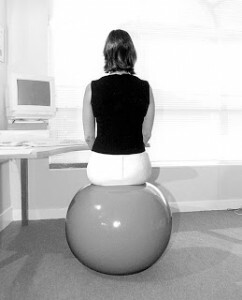 Start by sitting on the ball resting your hands on the table in front of you. 1. Keep the shoulders still and rest the wrists on the table while rolling the ball sideways. 2. Lift one cheek of your buttocks of the ball while rolling sideways. 3. Roll the ball over to the other side. 1. As above roll the ball away to one side. 2. When lifting the pelvis up sideways, hold this position for about 5 to 10 seconds. This exercise will strengthen the muscles of you hips and lower back. It’s one of the more subtle yet effective and important back strengthening exercises. 1. Start as above, lifting one side of the pelvis of the ball. 2. Let go of the table and reach with the arm/hand towards the ground on the side you are lifting the pelvis. Hold for 5 to 10 seconds and repeat on the other side. 2. Let go of the table and reach with the arm/hand towards the ground on the side you are lifting the pelvis. While keeping your head facing forward drop you ear towards your should. Hold the stretch for about 15 seconds and repeat on the other side. This entry was posted in back strengthening exercises, ball exercises in work, mobility exercises, neck stretches, stomach exercises on November 22, 2013 by flying form. Back strengthening exercises should include stomach exercises. Why? Most people who suffer from back problems have a muscle imbalance between the muscles of the front of their body and the muscles of the back. Their stomach muscles tend to be week and lacking tone while the muscles of the back tend to be tight. So, if you want to exercise for your back it is important to do stomach ecerises, too. In the previous posts you were introduced to simple stretching, mobility and strengthening exercises. Please be sure to review the general guidelines about back strengthening exercises and stomach exercises before continuing with the next set of exercises. 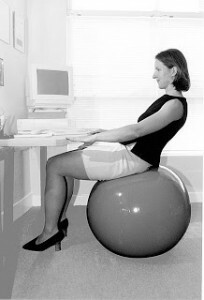 Start by sitting upright on the ball. 1. Tighten the muscles in your stomach by pulling your stomach in. Clench the cheeks of you buttocks together and hold these muscles tight throughout the exercise. The buttocks muscles are an important part of your back muscles. Engaging them by clenching them is an important part of any back strengthening exercise program. Make sure you keep breathing throughout theses stomach exercises. 2. Start rolling the ball forward as you curve your lower back, moving your lower back towards the ball. Make sure you curve the lower back onto the ball as oppose to leaning your upper back backward. 3. Bring your upper body back a little bit. Hold this position for 5 to 10 seconds while breathing normally. To make above exercise more strenuous, you can let go of the table top and bring your hands to the shoulders. To push it even harder bring the hands behind the head and/or straighten the arms towards the ceiling. As before ensure you are breathing normally throughout the exercise. This entry was posted in back strengthening exercises, ball exercises in work, stomach exercises on November 22, 2013 by flying form. In the previous post you were introduced to two simple neck stretches and mobility exercises. Please be sure to review the general guidelines about spinal movement before continuing with the next set of exercises. As a quick reminder, avoid head movements in more than one direction. That means you only tilt your head but don’t turn it at the same time. Don’t try to mobilise or do neck stretches were you are twisting and turning or rolling the head. 1. Start with the head being upright, shoulders are back and your back is straight, rest your hands in your lap. 2. Drop your head away sideways, bringing the ear towards the shoulder. Make sure to keep the chin up. 1. In order to stretch the neck muscles while doing the above exercise, drop one hand down and let your arm hang along the body. 2. Now drop the head away from this side towards the opposite shoulder. By pushing the hand towards the floor, you can increase the stretching feeling. Again hold this position for about 10 seconds. 1. Pull the shoulders back. Make sure not to arch the back. To ensure a good spinal position, keep the tummy muscles tight. 3. Shrug the shoulders pulling them up to the ears as hard as you can. Hold this position for 3 seconds and then relax. Avoid holding your breath. Look out for Active Sitting Part IV for more exercises. This entry was posted in mobility exercises, neck stretches, shoulder stretches on November 20, 2013 by flying form. 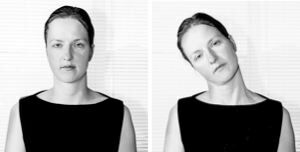 The following set of neck stretches will help you relax you neck muscles. They will also mobilize your neck. Moving your back and neck reduces the adverse effects of inactivity through prolonged sitting. The neck stretches and the exercises in our active sitting program mobilize your joints, strengthen your musculature, stretch tight and tense muscles and increase your overall level of energy. The exercises are easily done and can be repeated frequently during the day. The more you engage in the simple routine the less likely you will suffer from the effects of continuous inactivity. Spinal movements should be unilateral, the movement should only take place in one direction. We should for example avoid twisting and bending the spine at the same time. This applies to exercises as well as daily movements. Exercises or movements to ‘loosen up’ such as rolling the head can cause damage rather than being helpful and should be completely avoided. 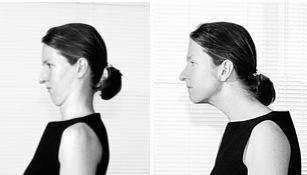 Be sure to review the general guidelines which apply to neck stretches as well as all the other exercises you will find on this site. Spinal movements should also avoid hyper-extension of the back, you should not curve the back backwards. Again, some exercises such as dropping the head back should therefore be avoided. 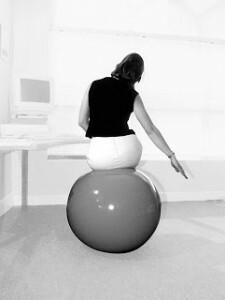 When exercising on the ball, sit upright and allow the spine to be in its natural curve and in good alignment. 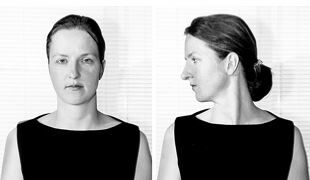 Breath normally during all neck stretches. Tighten the muscles in your stomach (simply pull your stomach in) as the musculature supports the lower back, stabilizes the hip and makes the exercise more effective. Hold on to the edge of the table or rest your wrists on the edge of the table, unless instructed otherwise. 1. Push the head forward, as far as possible, while keeping the shoulders back. 2. Pull the head back, keeping the chin down. Hold your head in this double chin position, then push it forward again. 1. push the head forward as before. 1. Keeping the shoulders straight and still and rest your hands in your lap. 2. Turn your head as far as possible, looking over your shoulder. Repeat on the other side. Compare the two sides and see if you have equal mobility when turning your head. You will find Part III of the Active Sitting Program and more neck stretches in the next post. This entry was posted in active sitting program, ball exercises in work, neck stretches, stretches on November 18, 2013 by flying form.